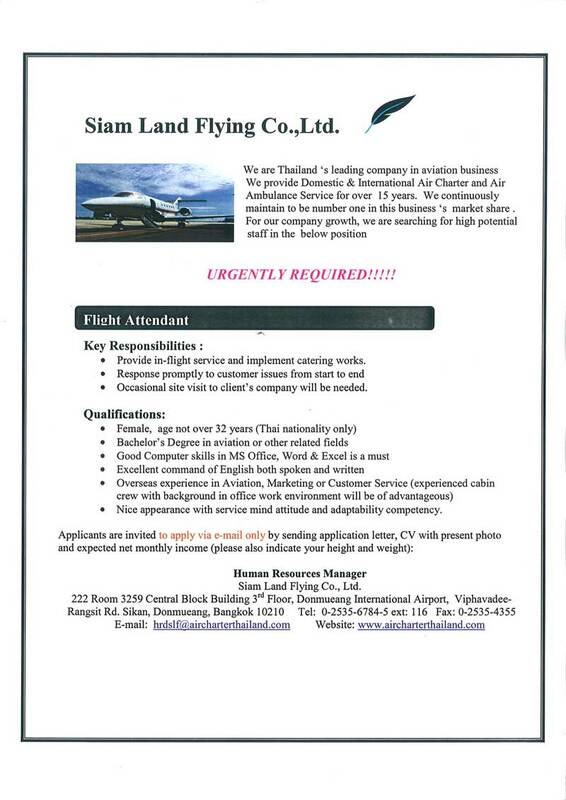 We are Thailand s leading company in aviation business. We provide Domestic & International Air Charter and Air Ambulance Service for over 15 years. We continuously maintain to be number one in this business s market share . -Nice appearance with service mind attitude and adaptability competency. 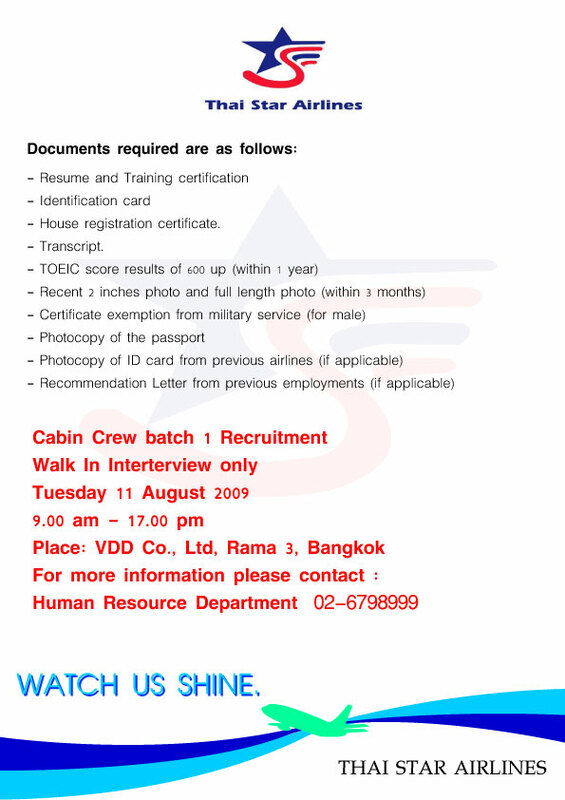 Siam Land Flying Co., Ltd.
- Experienced Crew with more than 3 years experiences can be considered as Senior Flight Attendant. 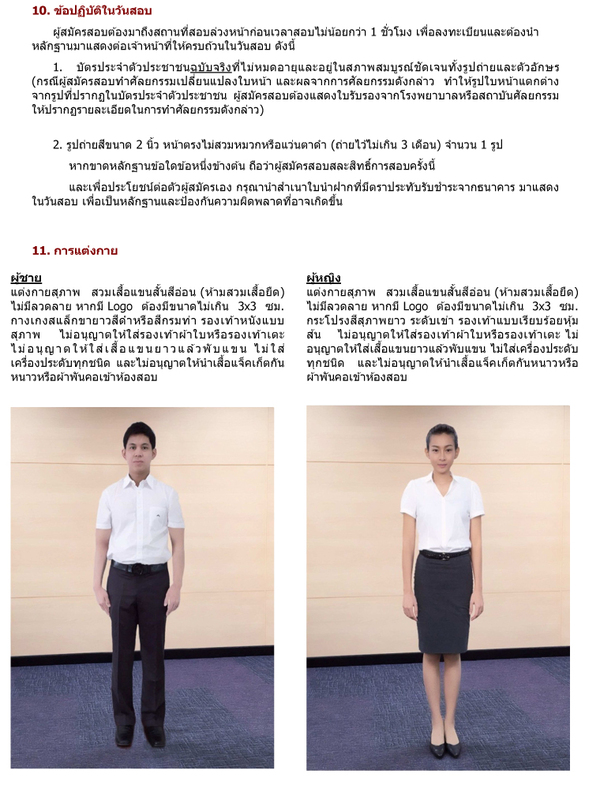 - Minimum height(Bare Feet) Female 160 cm./Male 170 cm. After completing and submitting your application, our human resource team will identify and select qualified candidates based upon criteria of needs. 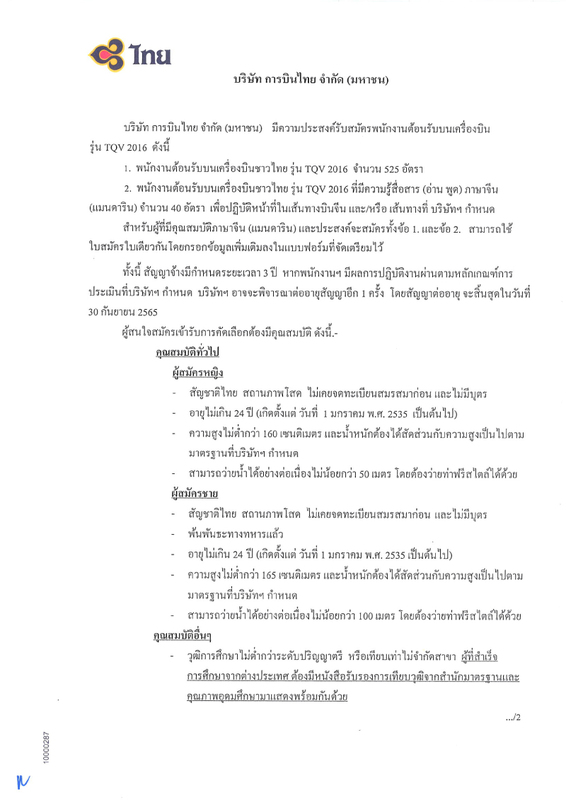 If selected, candidates will receive an e-mail containing instructions for next steps. Online application for the cabin crew position is now open and will close on Sunday, 3 June 2018. Service minded people who respect safety on board the aircraft&are highly motivated in an international and team work environment. 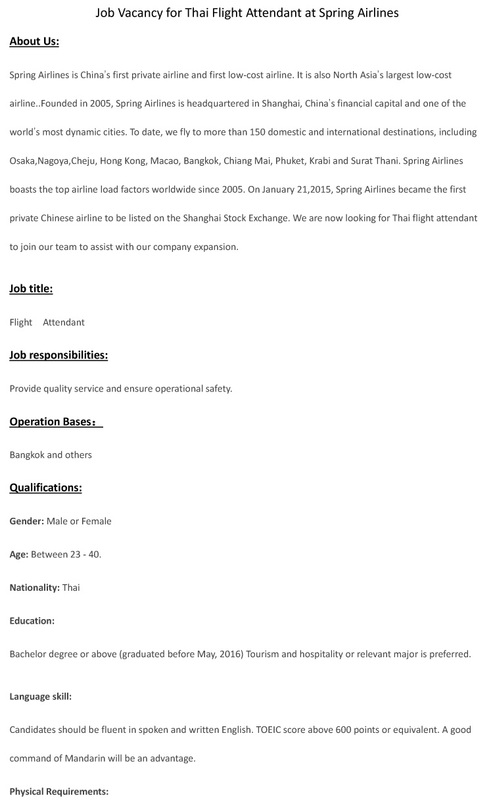 - Have experience as flight attendant for at least 7 years. 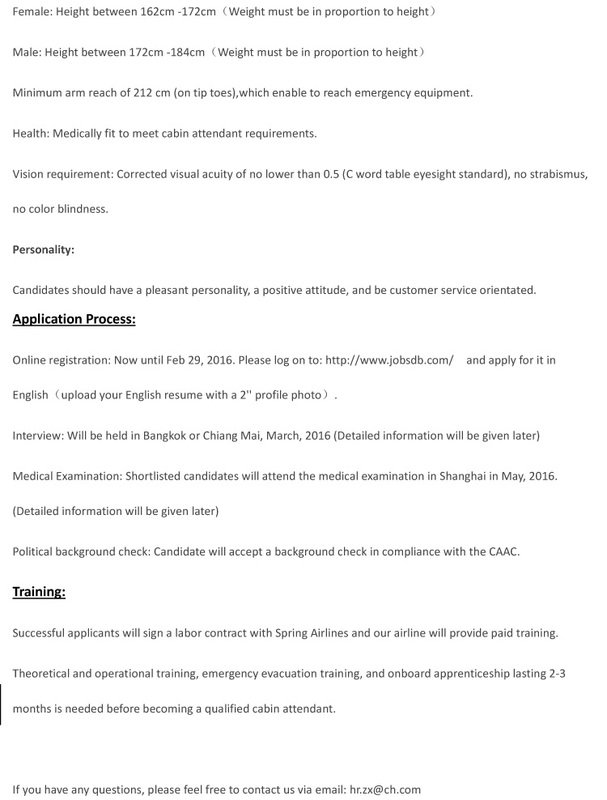 Flight attendant (Phuket base only) ***Urgent*** Service minded people who respect safety on board the aircraft&are highly motivated in an international and team work environment. > Japanese language knowledge which certified N1 – N4. 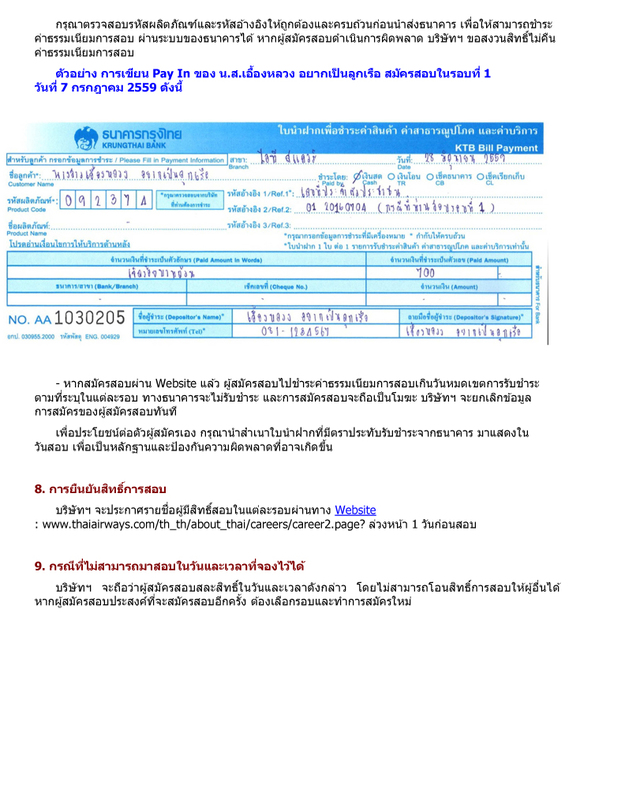 > Thai Female/ Male minimum 22 years of age, Thai Nationality, Single. > Minimum Height Minimum height at least 170 cm. (Male) and 160 cm. (Female), (Weight must be in proportion to height). > Minimum University graduate with a Bachelor’s degree, new graduates are welcomed. 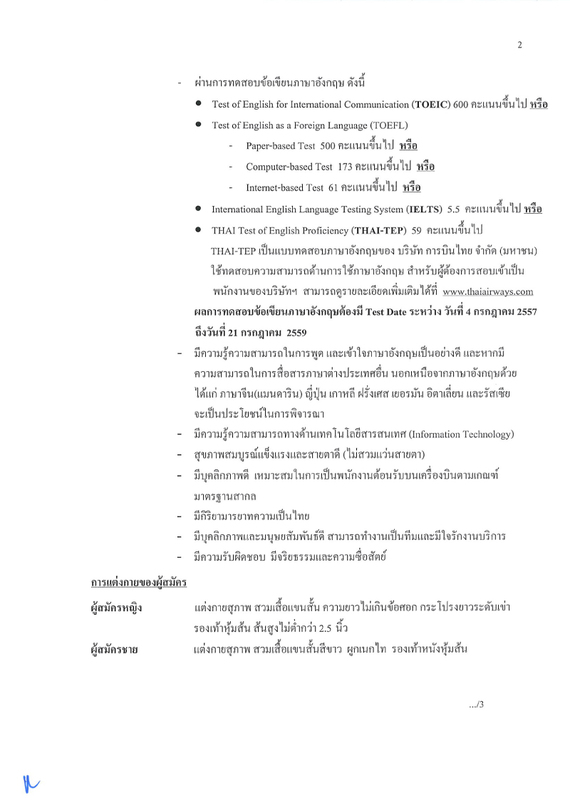 > TOEIC score results of 550 up (within 1 year). > Fluency in written/spoken English. > Medically fit to discharge the Cabin Crew duties. > Freedom from any physical or mental illness which might lead to incapacitation or inability to perform Cabin Crew duties. > Have a positive attitude, pleasant personality with ability to provide excellent service, working within a team environment. > Ability to swim, without a flotation device. > Good appearance, poised, smart looking and well-groomed, service minded, cheerful and passionate. > Exempted from military service (Male only). Time: 09:00 am. – 04:00 pm. 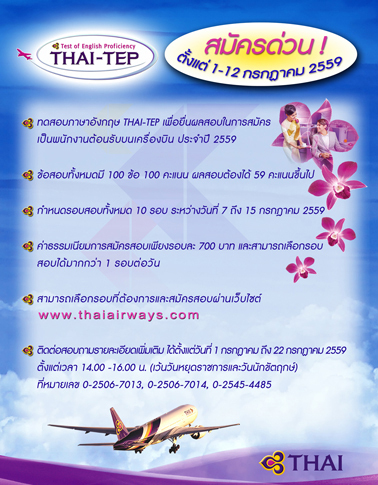 Thai Platinum International Airlines is Thai's new premium service airline. We will offer superior quality, service, and value in every "scheduled flight and charter flight". Our airline will connect the flight network from Bangkok to Thai domestics, Asia Pacific, and Middle East with Airbus A320s and A330s. Choose any one of the above and you will gain the chance to maximize your potential and expand your knowledge base, working alongside some of the world’s best airline professionals. We recruit the best - highly motivated achievers with specialist skills. Our aim is to target these professionals, utilize their high energy and drive and provide them with an unequaled challenge in one of the world's leading airlines. 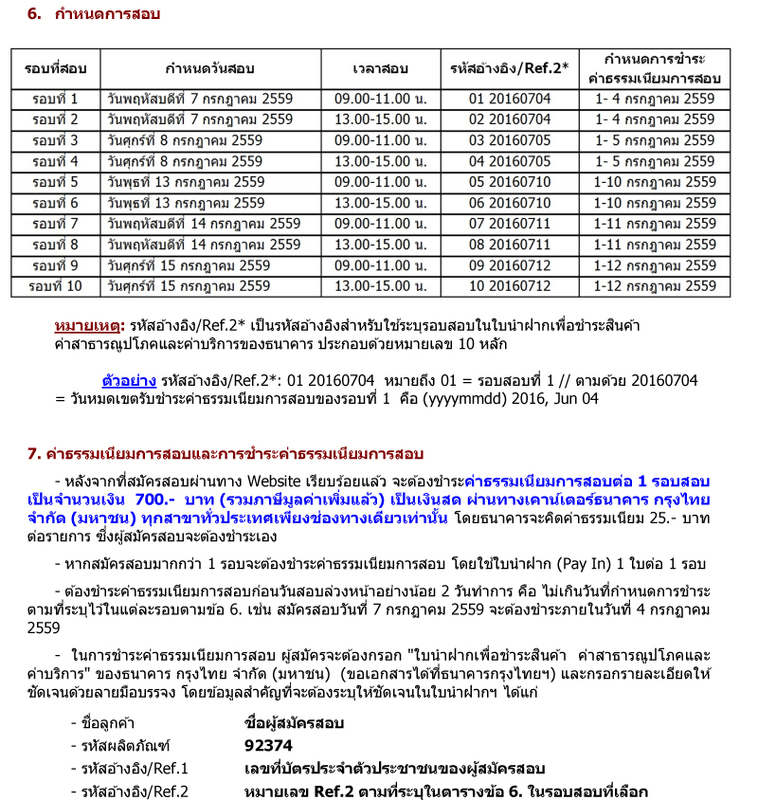 Thai Regional Airlines is offering domestic and regional scheduled flights to Nakhon Ratchasima, Buri Ram, Hua Hin, Chiang Mai, Phuket and Hat Yai. We also operate international flights to Seoul, Varanasi, Gaya and Kathmandu (Oct 2, 2012). 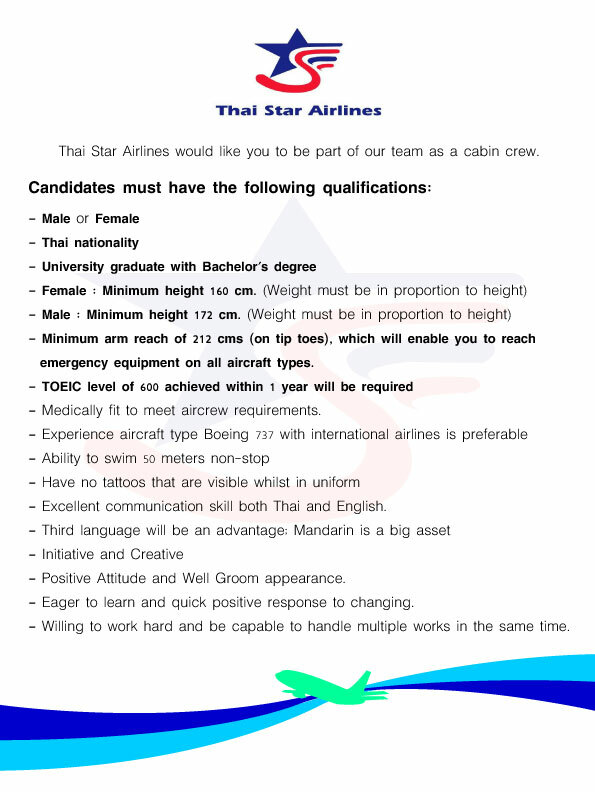 Thai Regional Airlines is always looking for bright, passionate and talented people to join us. Maximum in 45 years of age. 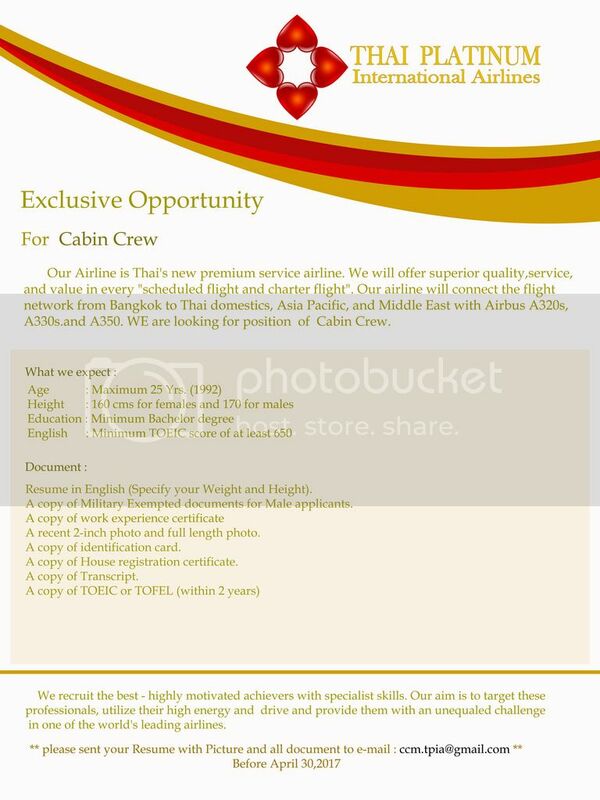 (if age over 30 years old aviation experience require). Minimum in height 153 cm, height and weight in proportion. Physically fit with a good attendance record in your current position. Hard working, flexible & willing to operate on a shift roster. Previous experience in the service / hospitality industry is an advantage. Ready to meet the challenge of dealing with people and demanding situations. 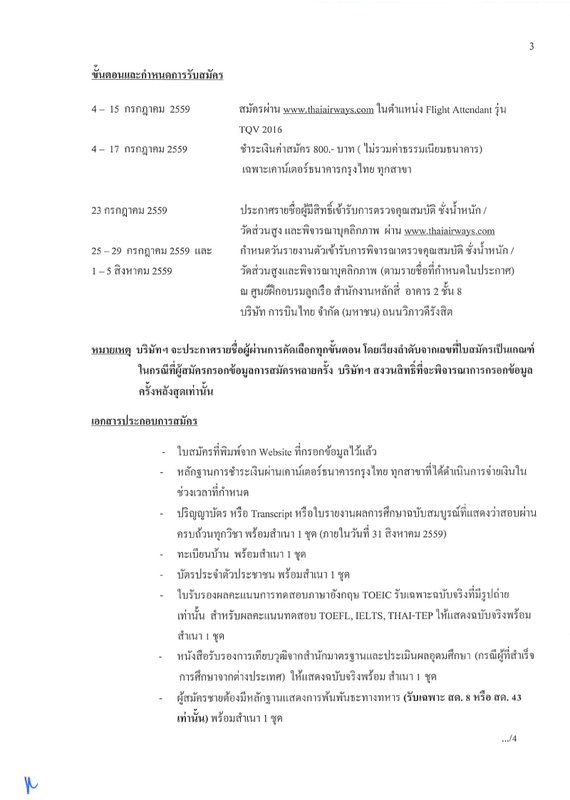 Following to be enclosed application form (one photocopy of each, original documents required for recruitment day). 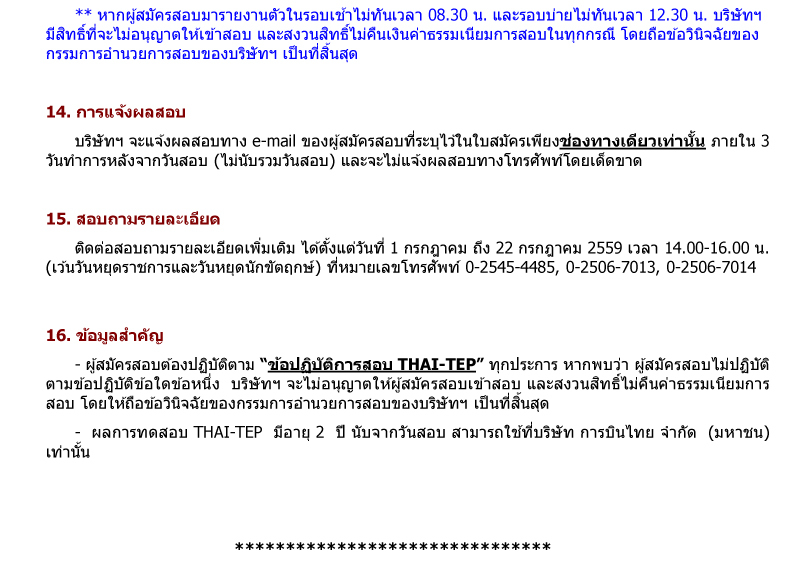 Recruitment Day will be announced on Thairegional Airlines website. At United we behave every tourney is an opportunity to shine Were an airline with a solid future, and a list of worldwide destinations that continues to grow. Right now we're looking for people who embody the spirit of thoughtful and attentive customer service to fill the very important role of flight attendant. We are looking for customer-focused adaptable reliable, positive high energy self-motivated team players who thrive in a fast-paced, dynamic environment. If you have these qualities and a desire to help set United apart from the competitor, we want you at United. We offer competitive benefits and unlimited worldwide travel privileges for you and your eligible family members with your personality and skills, you can go far with United. [=|V|oo-Yo|/|g=] is .. b e n * ..